Sew together 16 of these 22 1/2 degree triangles to create a complete circle; 8 to create a half-circle; or 4 to create a quarter-circle. Create Fans, Dresden Plates, etc. up to a finished size of 36 inches. Total ruler length is 18 1/2". Use the vertical line to fussy cut stripes or cut half triangles (the 1/4 inch seam allowance is marked). Or use the angled lines to create intricate blocks as instructed in companion patterns. The ruler slides easily over the fabric until pressure is applied. Then, our exclusive gripper holds the fabric in place while cutting, eliminating slipping and miss-cuts! 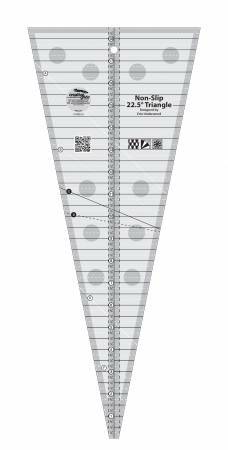 The ruler comes with fully illustrated step by step instructions or scan the QR Code printed on the ruler to view a video demonstration. Creative Grids Rulers have a MAP (Minimum Advertised Pricing) Policy. Please do not advertise them for less than the suggested retail.